Positano is every bit as incredible as the photos make it out to be. There really is nothing quite like a town constructed into the side of a mountain on the Almalfi Coast. Each and every turn is completely picturesque and the food is oh so delicious. If you’re looking for a relaxing getaway, then Positano should be on your list. 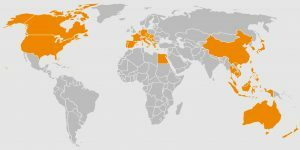 Better yet, if you’re looking for a luxurious, romantic, AND relaxing getaway, book a flight right now! There’s nothing like waking up in the morning, walking out onto your balcony with the one you love and taking in views of the coastline while sipping Italian coffee. Before you go, there’s just a few things you need to know, and I’ve got you covered! Unfortunately, Positano is a bit tricky to get to. Why? Because it’s located on the Almalfi coast, set on the side of mountain. You have a few options to get there, but you’ll need to start in Naples. 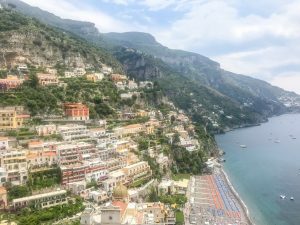 You can rent a car in Naples and drive to Positano, which I DO NOT RECOMMEND (unless you are a very experienced mountainous driver, because the roads are insanely windy and dangerous ). 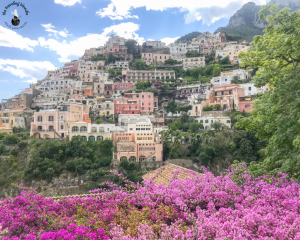 The best (and most affordable) option, which we personally elected, is to stay in Naples overnight, take the train from Naples to Sorrento, then take a ferry from Sorrento to Positano. If you’re coming from Naples Airport, then you’ll need to grab the shuttle bus (located one block just outside the airport) to Napoli Central Station (Naples Main Train Station) for 5 Euros. It only takes about 20 minutes. 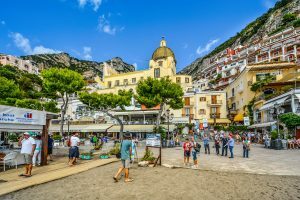 Do note you also have the option to take the train to Salerno and stay there/take a ferry to Positano. 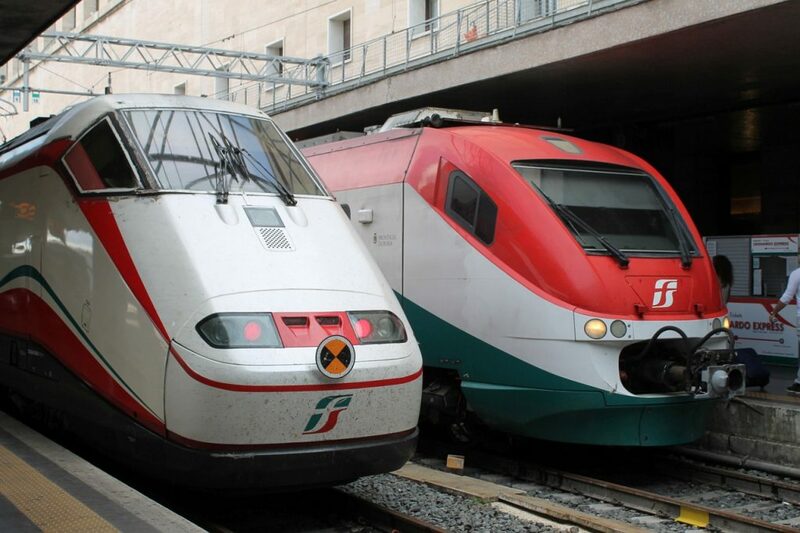 Fortunately, there are many hotels near Naples Train Station to choose from. We chose Ibis Styles Hotel because they allow dogs and they have free baggage storage. We were so happy to leave our large suitcases with them when we went to Positano, because there are SO many stairs and hills in the city. I MUST point out to you, though, that Naples is a bit shady compared to other cities in Italy, especially near it’s train station. We arrived late in the evening and, had it not been for Josh being with me, I would’ve felt unsafe. If you’re traveling solo, just be sure to move around that area of Naples only during the day, and ALWAYS watch your bags, purses and wallets, both on the trains and around the city. From Napoli Central train station, you can catch the local 1-hour train to Sorrento every 20 minutes, no need to pre-purchase a ticket. 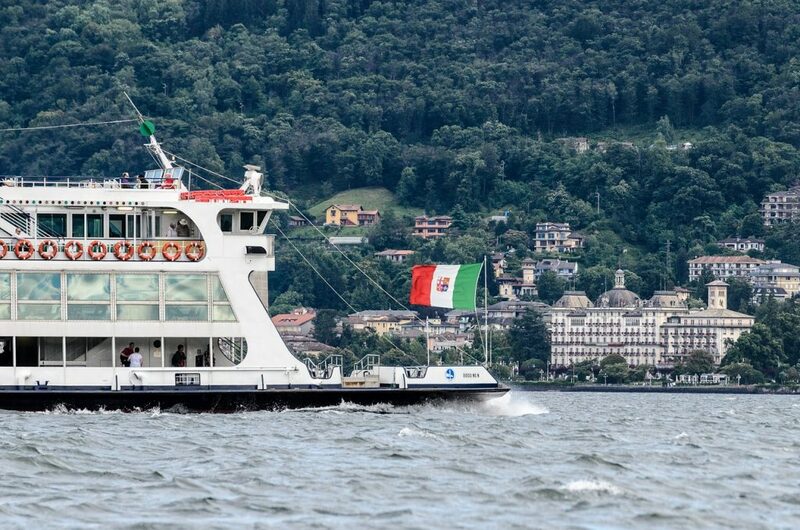 However, I would suggest pre-booking your ferry tickets from Sorrento to Positano, especially during peak season. We got ours for 20 Euros each (one-way) on okferry.com The ferry is a beautiful 45-minute ride along the coastline and it drops you right off at Positano. So have your camera ready! Alternatively, you can have a private car drive you from Naples Airport to/from Positano, for 130 Euros one way (120 if you pay cash). This can be arrange with your accommodation. We ended up having to choose this option when we left Positano because we had an early morning flight to Malta and the ferry boat was unavailable at that time. The ride is absolutely GORGEOUS but really really windy and can make you car sick, if your prone to that. The ride will take you about 2 hours, depending on traffic. There are an ENDLESS amount of accommodation choices in Positano, from Airbnb’s to boutique hotels. I literally couldn’t recommend our hotel, Casa Albertina, any higher. 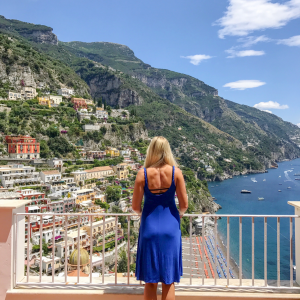 If we didn’t stay at this classic, quaint hotel with a balcony overlooking overlooking Positano, we most certainly would not have had such an incredible experience. Casa Albertina is surprisingly a three star accommodation, but it felt so much more prestigious than that. Each room is uniquely decorated and, if you get a room with a balcony (you MUST), you’ll have the MOST breathtaking views right at your fingertips. We barely left this hotel, only to go roam through the town and eat, because we loved it so much! Positano is SO quaint and romantic, you’ll just want to sip coffee or champagne on your balcony and take in the views. When you feel like exploring, head down the hundreds of steps to navigate the quaint streets where you’ll stumble on an endless amount of boutique shops. Whether you’re looking for souvenirs, jewelry, homemade ceramics, lemon-inspired foods, hand-made sandals (check out Nana’s Shop) or Positano-style clothing, you’re sure to find more than what you were looking for! Stop by the beautiful 12th century Santa Maria Assunta Church located right in the center of the city. This focal point cannot be missed as soon as you land on the shore, as it towers over the other buildings in the center of town. I absolutely loved waking in the mornings to its church bills ringing. Be sure to pay the additional fee to enter the crypt below for a really unique experience! 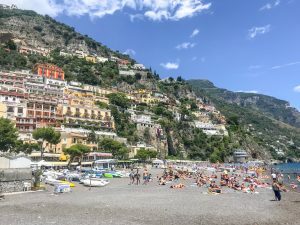 If the weather permits, then a trip to Spiaggia Grande Beach is a must when visiting Positano! Although the beach isn’t filled with white sand like Thailand, you’ll still have a wonderful day soaking in the sun. It is essential to jump in the water and take a photo of the gorgeous city of Positano behind you! Note that there are paid parts of the beach and free areas. 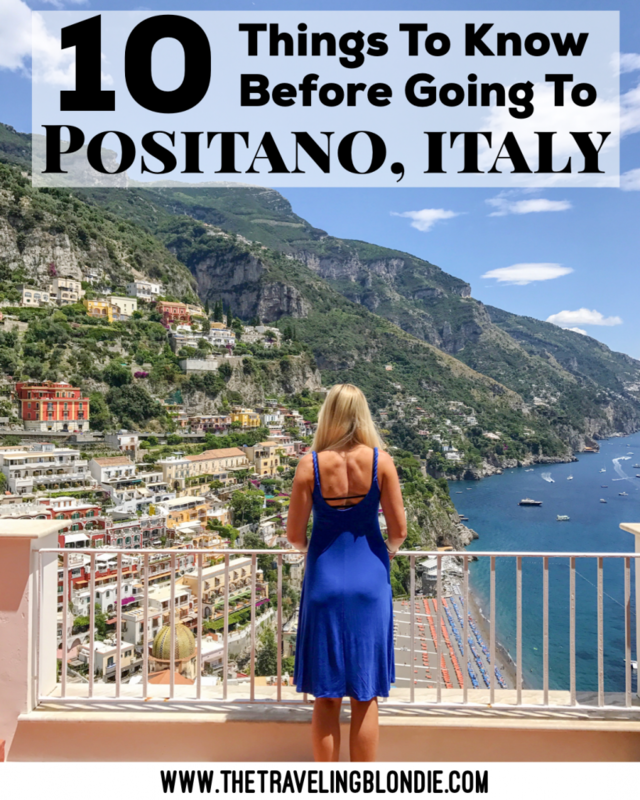 You’re going to think this sounds crazy, but you MUST ride the local bus when you visit Positano! It is SUCH an experience riding up (and down) the mountain! When you arrive, head to the tourism office in the center of town and they’ll direct you to the bus stop. You can buy bus tickets at the tobacco shop just opposite the bus stop in town. Riding the local bus on the windy streets up the mountain will surely be something you’ll never forget and it costs just a few dollars! 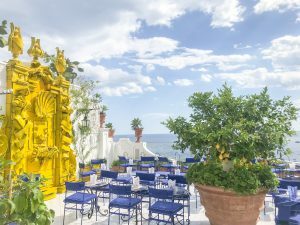 If you’re staying at Casa Albertina, just tell the bus driver you’re getting off at Cafe Positano, which is located just below the hotel. One thing I ABSOLUTELY regret not doing is the Walk of the Gods! This two hour long hike takes you through the trails hugging the cliffs from Agerola to Positano. The hike is approximately 4.3 miles (7km) and takes around 2 hours. Be sure to pack water & snacks, wear proper footwear & don’t forget your sunscreen and a hat! If time permits, I highly suggest a day trip to Capri as well (something we unfortunately couldn’t squeeze in either…guess we’ll just have to go back soon)! 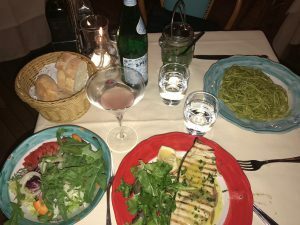 There is NO shortage of delicious food in Positano and I wish I would’ve had weeks to explore all the different options. Fortunately, a friend sent us there with a few incredible recommendations up her sleeve. If you’re looking for a unforgettable dining experience, then Chez Black is WHERE IT’S AT. This place is the creme de la creme. Oh mannnn the food is great, the atmosphere is awesome and it’s nestled right in front of the ocean. We loved this restaurant so much, we ate here twice in the three nights we spent in Positano. Be sure to order the pesto pasta and any fresh fish on the menu, they’re all cooked perfectly and will melt in your mouth! For dessert, order the tiramisu…it’s the best we’ve ever had! Buca di Bacco came HIGHLY recommended for fresh seafood and a great atmosphere. We initially planned to dine here, but we loved Chez Black so much, that we ended up going back there and cancelling our reservation with Buca di Bacco. We’ll absolutely be checking out this restaurant next time we’re in town (unless we just eat at Chez Black for every meal again, haha)! 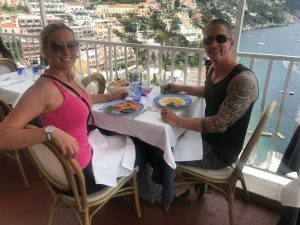 If you’re looking for a restaurant with great views overlooking the city and delicious food, then Cafe Positano should be on your list as well. Do take note that the service here is sub-par (we dined here twice since it’s located just underneath Casa Albertina), but the food, views and atmosphere make up for it. Be sure to order the ravioli, it is sooo creamy and delicious! Even if you’re not into drinking, just paying a visit to Franco’s Bar for coffee or tea is 100% worth it. The views are absolutely gorgeous at sunset, making it one of the most popular places in all of Positano! Be sure to go early as the place fills up fast! Alternatively, if you’re looking for the ABSOLUTE best place to drink in all of Positano, make it on your balcony! Grab a few bottles of bubbly or Italian wine at one of the local shops and enjoy the sunset from the comfort and privacy of your own balcony at Casa Albertina! Pack light. If you think you’ve packed light, then take out half of what you already packed and that will be sufficient for Positano. Why? Because there are SO many hills and stairs, carrying anything is a nightmare! 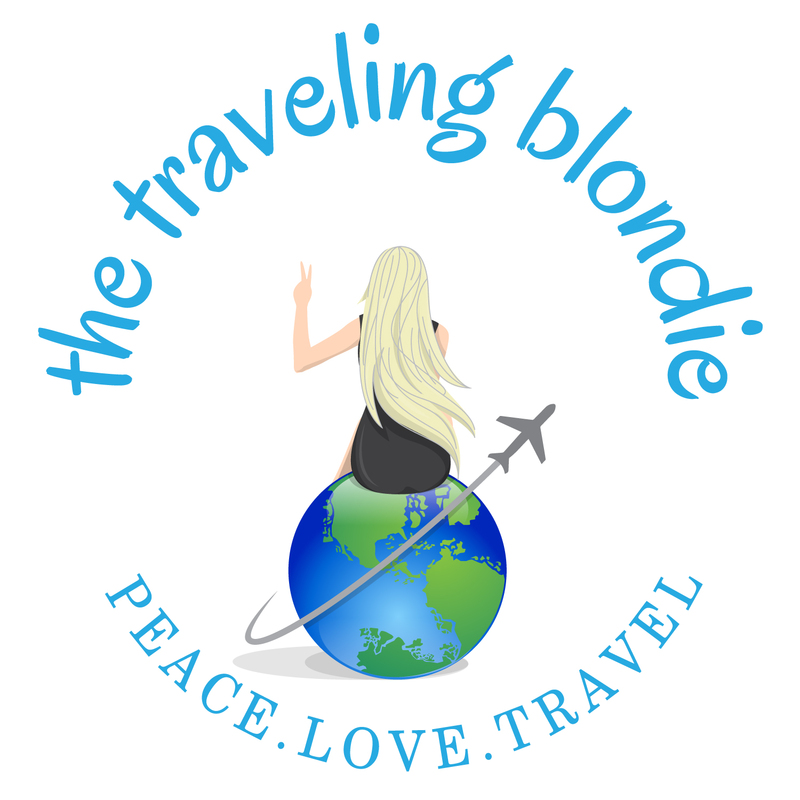 Josh and I each had a backpack and we had one 50-pound suitcase and it was WAY too much to lug around the cobble-stone streets (our Samsonite’s wheels took a serious beating in Europe). Looking to save some cash and bring your own adult beverages to Positano? Stop at the grocery store near Sorrento train station on the way to the ferry to stock up on alcohol. We purchased wine, vodka and champagne at a fraction of the cost of what it was in Positano. Dress to impress. Positano is posh, so bring your best dresses and shoes. No sweatpants permitted in this region. Allow extra time. 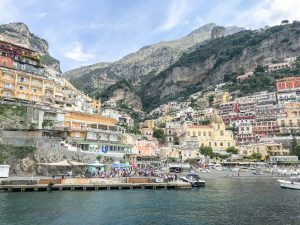 It takes what feels like forever to get from Naples to Sorrento to Positano, so plan extra time, as the local trains and ferries tend to run a bit behind schedule.